Hundreds of immigrants in the South Bay are worried Friday that they've lost money and their chance to stay in the United States. Santa Clara County sheriff’s deputies in November arrested James Lopez on suspicion of running a fraudulent immigration assistance service that is believed to have duped more than 1,000 people. Investigators say that what Lopez did — or didn't do as the case may be — could result in his clients being deported. Lopez faces several felony charges, including forgery, grand theft and practicing law without a license, according to investigators. After NBC Bay Area broke the story, investigators received calls from more potential victims. And people are continuing to come forward, they said. Santa Clara County sheriff's deputies have arrested a man accused of running a fraudulent immigration assistance service, and duping roughly 1,000 people and counting. Robert Handa reports. The response has been a "little more than what we expected," Lt. Elbert Rivera said. He continued: "We've had over 30 calls that we're filtering. There's still some calls that we've got to get back to." A victim who identified himself only as Jesus said he was trying to remedy his wife's immigration status when he shelled out more than $1,000 of hard-earned money to Lopez, who was allegedly operating an illegal consulting service in Cupertino without state approval. 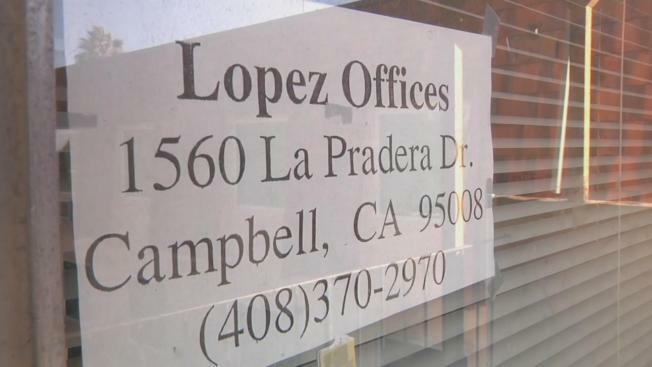 The business advertised itself as a place to help immigrants, but Lopez may have actually been targeting them, investigators believe. He is suspected of providing improper service to about 1,000 clients and counting, while charging each of them about $1,200, they said. “He was charging fees for services in regards to immigration paperwork … which don't require any fees,” Rivera said. “It appeared he was also forging documents, just based on the evidence." Lopez did not respond to NBC Bay Area's requests for comment.